Another ExplodingDog/Cyanide and Happiness-style graffiti stick figure scrawled on a garbage can along Penn Ave. 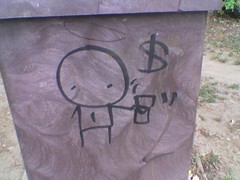 The can and dollar sign indicate a nearby homeless panhandler. Note the saintly halo, possibly added by a later artist.